Tara Bannister's abusive stepfather finally pushed her too far. To save herself she had to kill him. Or did she? Tara's confession doesn't add up, and as her self-defense claim crumbles, attorney Leslie Connors must overcome more than first-trial jitters to mount a credible defense. Leslie must save Tara's life-against her client's will. In the midst of this taxing case, Leslie's wedding plans to law partner Brad Carson are interrupted by a devastating diagnosis. Does she dare tell Brad? Before the final gavel falls, Leslie must confront the truth about herself and her mysterious client, or the darkness of the past will swallow them both. - Publisher "[Singer] delivers a fresh approach to the legal thriller. . . ." -BOOKLIST She confessed to murder. But the evidence never lies. Can a lawyer save a client from herself? Tara Bannister's abusive stepfather finally pushed her too far. To save herself, she hadto kill him. Or did she? Defense attorneys expect to catch their clients lying. It's part of the game. But Tara's confession doesn't add up, and attorney Leslie Connors must overcome more than first-trial jitters to mount a credible defense. She'll need to uncover what really happened . . . and it just may be more shocking than the crime itself. In the midst of this taxing case, Leslie's wedding plans to law partner Brad Carson are interrupted by devastating personal news. Does she dare tell Brad? Before the final gavel falls, Leslie will have to confront the truth about herself and her mysterious client, or the darkness of the past will swallow them both. 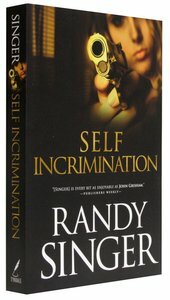 About "Self Incrimination (Leslie Connors Collection Series)"
"[Singer] delivers a fresh approach to the legal thriller. . . ." -BOOKLIST She confessed to murder. But the evidence never lies. Can a lawyer save a client from herself? Tara Bannister's abusive stepfather finally pushed her too far. To save herself, she hadto kill him. Or did she? Defense attorneys expect to catch their clients lying. It's part of the game. But Tara's confession doesn't add up, and attorney Leslie Connors must overcome more than first-trial jitters to mount a credible defense. She'll need to uncover what really happened . . . and it just may be more shocking than the crime itself. In the midst of this taxing case, Leslie's wedding plans to law partner Brad Carson are interrupted by devastating personal news. Does she dare tell Brad? Before the final gavel falls, Leslie will have to confront the truth about herself and her mysterious client, or the darkness of the past will swallow them both. Randy Singer serves as general counsel for the North American Misson Board and on the Board of Legal Advisors for the American Center of Law and Justice, a public service law firm that defends religious freedom in the United States and abroad. He is the author of Directed Verdict. In this thrilling suspense novel, a lawyer is confronted by the martyrdom of a Christian missionary in Saudi Arabia. He resolves to stand up to injustice despite seemingly insurmountable odds, filing a civil rights suit against the head of the religious police. In Saudi Arabia, two American missionaries are targeted by the infamous religious police???Muttawa. The man is tortured and killed; his wife arrested on trumped-up charges before being deported to the United States. Compelled by the injustice of her plight, young attorney Brad Carlson files an unprecedented civil rights suit against Saudi Arabia and the ruthless head of the Muttawa. But the suit unleashes powerful forces that will stop at nothing to vindicate the Arabian kingdom. Witnesses are intimidated and some disappear; jurors are bribed; and a member of Brad?? ?s own team may be attempting to sabotage the case. As Brad navigates a maze of treachery and deception, he must gamble his case, his career, and the lives of those he loves on his ability to bring justice to one family, challenge the religious intolerance of a nation, and alter the course of international law. Directed Verdict is a Christy Award?? ?winning novel.